I started off with a base of Sinful Colors Snow Me White and then painted on three coats of China Glaze Hay Girl Hay! When that was totally dry I used some lacy black water decals along the top, and then sponged on a gradient along the tip with China Glaze Where's the Party Canon At? because I felt it needed a bit of colour. And a quick macro to finish off the post! So now that you've seen the look let me know: Do you think it's best with the pink, or should I have held off and just left it with the white iridescent base? :) Let me know! How pretty! 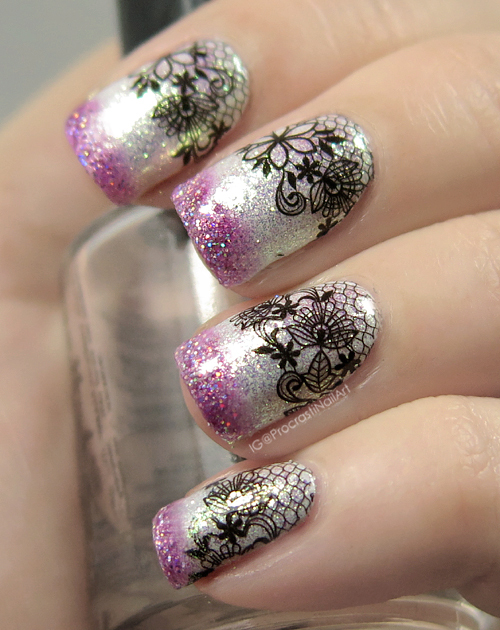 The gradient and lace is lovely together like this. I like the pink tips! Wow, these are beautiful!! I like the pop of color! I thought it was a thermal polish! I like the pinky tips! So pretty! The pink tips make the mani unique. I love the addition of the pink. It looks like you were inspired by a dress or article of clothing. Quite lovely! No need to second guess, pink tips was the way to go 😉! 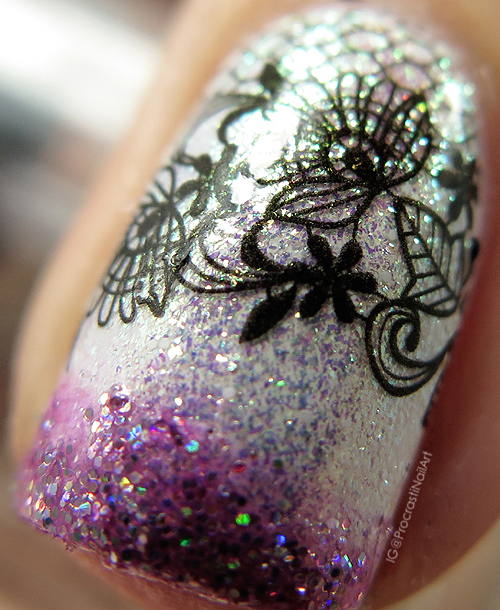 What a cool way to use those polishes - that flakie is really reflective!